Eighteenth Street Development Corporation (ESDC) is excited to announce the Mole de Mayo 2016 winners for the Best Mole and the People’s Choice. 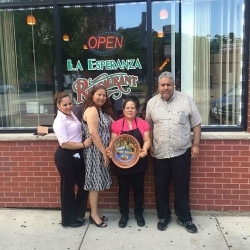 The award for the Best Mole goes to La Esperanza Restaurant, located at 1864 S. Blue Island Ave. and the award for the People’s Choice goes to La Catrina Cafe, located at 1011 W. 18th St. Alex Esparza, executive director from ESDC presented the winners with a hand-painted, cazuela de mole by artist, Victor M. Montañez. This year’s select panel of judges for the Best Mole included: Daniel Gutierrez Jr., owner of Cantón Regio; Sergio Reyes, owner and chef of DeColores; and Daniel Espinoza, chef of Antidote. After mucho mole and much deliberation, they decided on their winner, Adela Salazar of La Esperanza who won them over with her tacos and tortas de mole. 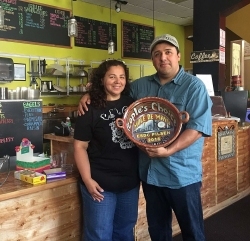 “The key deciding factor was the flavor,” says Gutierrez Jr. former 2015 People’s Choice winner. “The sample was served piping hot which is why the ingredients enhanced the overall tasting experience much more.” The 7th Annual Mole de Mayo Festival (May 27-29) drew over 50,000 people during the 3-day celebration in Pilsen.